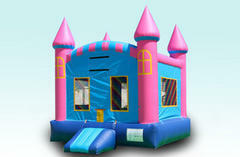 We offer this neutral themed bounce house for any young lady that likes to jump. This bounce House Rental offers a spacious bounce area, and basketball hoop and as always it features a saftey ramp. If you like this bounce house but want to add a slide Check out our Combo Bounce Houses. This unit features a large bounce area that will provide plenty of room for your kids to jump, laugh and play with their friends. Add a ball to the fun and they can shoot hoops through the basketball hoop that is included inside this unit.